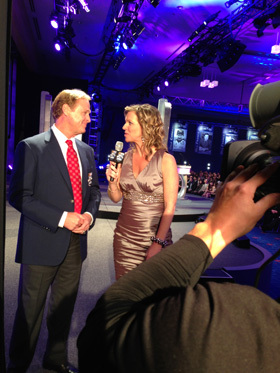 Krista Voda will continue her own “Hall of Fame streak” when she, alongside Rick Allen, co-hosts the 2015 NASCAR Hall of Fame Induction Ceremony, airing live on NBC Sports Network Friday January 30th at 8pm ET. Voda has been a part of every Induction since the NASCAR Hall of Fame opened its doors in 2010. However, this year’s ceremony will be a bit different. Instead of her usual role of interviewing the inductees following their acceptance speeches, Voda and Allen will share hosting duties from center stage. This is a reunion, of sorts, for Voda and Allen. The two broadcasters, now co-workers at NBC, hosted NASCAR season-ending awards banquets together for the better part of the last decade. This will mark Voda’s on-air debut in her new role at NBC.